Synopsis: Two Puerto Rican NYPD detectives head to Paris to track down a stolen handbag. From Beverly Hills Cop to Hot Fuzz, people love fish-out-of-water cop movies. At least, they used to; there’s not a whole lot to love about Puerto Ricans in Paris. Puerto Ricans in Paris is about a couple of New York City police detectives named Luis and Eddie (Luis Guzmán and Edgar Garcia, both from “How to Make It in America”) who are approached by a French handbag designer named Colette (Paris-Manhattan‘s Alice Taglioni) who needs their help. A prototype of a bag from Colette’s new line has been stolen, and the thief is blackmailing her with the threat of flooding the black market with bootlegged knockoffs. Luis and Eddie are brought over to Paris to catch the thief and retrieve the bag, using any and all means at their disposal to figure out which of Colette’s trusted colleagues has double-crossed her. What Puerto Ricans in Paris boils down to is a simple buddy cop movie with plenty of culture shock. Of course Luis and Eddie are out of their element in Paris – if they weren’t, there would be no movie. Writer/director Ian Edelman (who worked with both Guzmán and Garcia on “How to Make it in America”) and co-writer Neel Shah (“Men at Work”) are able to squeeze in a little heart and a bit of humor, but Puerto Ricans in Paris is mostly just a by-the-numbers attempt at being a police procedural mystery, full of ineffective red herrings and predictably false leads, that relies too heavily upon its fish being out of the water. One thing that can be said about Puerto Ricans in Paris is that it’s extremely economical. At a little over eighty minutes, it’s short and sweet, and the characters cover a lot of ground, working their way through suspects and sting operations in record time. Luis and Eddie even get to soak up some Parisian nightlife, although those scenes tend to derail the momentum of the film. And, of course, the standard Hollywood forced love angle between Eddie and Colette doesn’t help the plot at all. But, at the end of the day, the flaws could be forgiven if Puerto Ricans in Paris was a compelling mystery, or even if it had a single twist that wasn’t telegraphed from a mile away. It’s not compelling and the twists are telegraphed, so the flaws in Puerto Ricans in Paris are impossible to overlook. 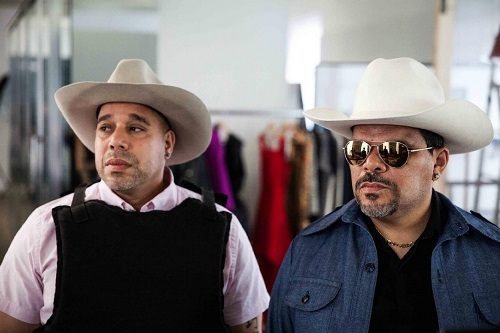 There are some good laughs in Puerto Ricans in Paris, but not nearly as many as one would expect from a movie that stars Luis Guzmán and Eddie Garcia as NYPD detectives who end up in France. Some of the humor comes out of left field, like when their female sergeant (Miriam Shore from “Younger”) tells them that, if they go out dancing with her that night, “maybe I’ll let you both reggae grind me,” then plays it off with a “What? What?” Other gags are visual, such as the ridiculous full-bodied t-shirt of Bruno Mars’ face that Luis wears the morning after a big concert. Then there are the archetypical comic tropes, like the way that Colette’s homosexual assistant Daniel acts just like Bronson Pinchot’s homosexual art gallery attendant in Beverly Hills Cop. There are some amusing moments, but they’re too few and far between to save Puerto Ricans in Paris from its own mediocrity.